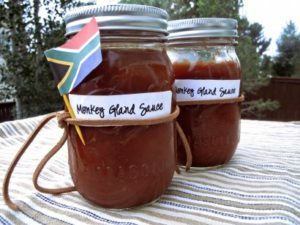 No Monkeys were harmed in the making of this delicious Home-made Monkey Gland Sauce! It goes perfectly with burgers, chips, steaks, chicken… the list goes on! Start by heating oil in a saucepan and frying your garlic and onion until soft. Next, stir the rest of your ingredients in and stir through, before reducing the heat. Allow it to simmer for 40 minutes.